Beatrice Milner was born on the 1st May 1891, the daughter of Abraham Greaves Milner and his wife Annie Maria (nee Greaves) who married at Dewsbury All Saints Church on the 1st June 1878. Annie Maria of Dewsbury was the daughter of Inn Keeper, Mark Greaves and Abraham was the son of Ossett manufacturer, Thomas Milner. Beatrice was baptised at St. Mary’s Church, Gawthorpe and Chickenley Heath on the 1st March 1902, by which time she was 10 years of age. Her parents were living at High Street, Gawthorpe and her father was a manufacturer. By 1911 the Milners, who had five surviving children from their marriage, were living at 5, High Street, Gawthorpe. Abraham was now working as a woollen manufacturer. Nurse Beatrice Milner was killed in a German air raid on Kingsdown Road, Teignmouth, Devon, which took place on the 8th May 1941, damaging Teignmouth hospital where she was working and adjacent buildings. 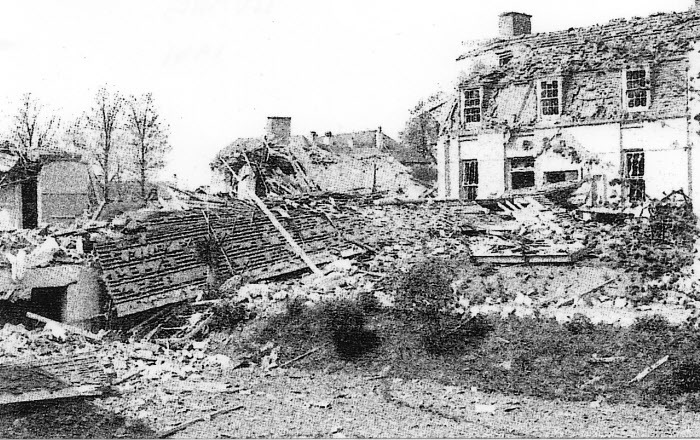 During the German air raid, eleven people were killed: seven patients and three nurses, plus one person living at the house next door. Miss Mules, a local doctor, owned 'Lareys', where Nurse Milner lived, which before the war was a convalescent home. The hospital wasn't rebuilt until 1954. Above: The bombed out remains of Teignmouth Hospital after the German air raid in May 1941, where Nurse Beatrice Milner lost her life.